During the first twenty-four hours-your face will feel puffy, your nose may ache, and you may have a dull headache. You can control any discomfort with the pain medication prescribed by Drs. O’Halloran and Egan. Plan on staying in bed with your head elevated (except for going to the bathroom) for the first day. You’ll notice that the swelling and bruising around your eyes will increase at first, reaching a peak after two or three days. Applying cold compresses will reduce this swelling and make you feel a bit better. We use a cool gel mask to gently cool the tissues. In any case, you’ll feel a lot better than you look. Most of the swelling and bruising should disappear within two weeks or so. A little drainage is common during the first few days following surgery, and you may continue to feel some stuffiness for several weeks. Drs. O’Halloran and Egan will probably ask you not to blow your nose for a week or so, while the tissues heal. Drs. O’Halloran and Egan uses techniques to minimize packing and most of our patients do not need nasal packing. If you have nasal packing, it will be removed after a few days and you’ll feel much more comfortable. By the end of one or, occasionally, two weeks, all dressings, splints, and stitches should be removed. Most rhinoplasty patients are up and about within two days, and able to return to school or sedentary work a few days to a week or so following surgery. It will be several weeks, however, before you’re entirely up to speed. Drs. O’Halloran and Egan will give you more specific guidelines for gradually resuming your normal activities. They’re likely to include these suggestions: Avoid strenuous activity (jogging, swimming, bending, sexual relations-any activity that increases your blood pressure) for two to three weeks. Avoid hitting or rubbing your nose, or getting it sunburned, for eight weeks. Be gentle when washing your face and hair or using cosmetics. You can wear contact lenses as soon as you feel like it, but glasses are another story. Once the splint is off, they’ll have to be taped to your forehead or propped on your cheeks for another six to seven weeks, until your nose is completely healed. Drs. O’Halloran and Egan will schedule frequent follow-up visits in the months after surgery, to check on the progress of your healing. If you have any unusual symptoms between visits, or any questions about what you can and can’t do, don’t hesitate to. You will be given a prescription for a pain medication a steroid to reduce swelling and an antibiotic. It is important that you take these medications as directed. Pain medication will be given in the recovery room, and you will be instructed when the next dose may be given at home. Do not take pain medication on an empty stomach (will cause nausea). Use of narcotic pain medication can lead to constipation and may require the use of stool softeners. Antibiotics should be started the evening following surgery. If you have been given a prescription for oral steroids such as prednisone/ medrol these should be started the day after surgery. It is normal to have some bleeding during the first 48 hours after surgery. If the bleeding becomes steady or severe spray your nose with 2-3 squirts of Afrin(oxymetazoline) nasal spray to help control the bleeding. If bleeding persists call our office. Dr. Egan and Dr. O’Halloran will place nasal septal splints at the end of your surgery. Splints help to keep the septum in place while it heals. Splints are not packing. In fact, they are much more comfortable than packing and are easier to remove. The splints are removed at your first post op visit 1 week after surgery. The splints are secured in position with a stitch so there is no worry that they will become dislodged. The splints have tubes that allow your to breath while they are in place. However, these tubes can become blocked so it is important to irrigate regularly. All patients should begin nasal irrigation the morning after surgery. Irrigation should be done at least twice daily but can be done more often. 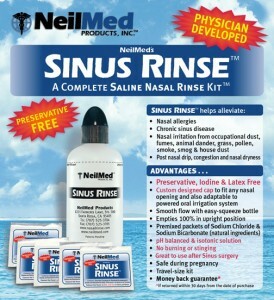 We recommend the Neil Med Sinus Irrigation Kit which is available at most pharmacies in the nasal care aisle. Diet: avoid hot and spicy foods for 5 days. Be sure to maintain hydration with adequate liquid intake. Keep your head elevated as much as possible for the first three days. Sleep with your head elevated on pillows. Place ice packs (frozen peas, crushed ice in zip lock, etc.) on your nose, eyes and cheeks as much as possible for the first three days. Change the gauze pad under the nose as needed depending on drainage. You may remove it and keep it off when the drainage subsides. No Heavy lifting/exercise for 2 weeks after surgery. No Aspirin, Advil, Motrin or other NSAIDS for 2 weeks after surgery.